What makes an effective marketing campaign? Unfortunately, most marketers aren’t able to answer this question. According to Content Marketing Institute’s 2018 Manufacturing Content Marketing report, only 33% of manufacturing marketers measure the ROI of their marketing efforts. This makes it difficult to determine whether your external marketing campaigns contribute to revenue growth over time. Before you can measure the return on your marketing campaign plan, you need to determine what you are trying to achieve. The most important thing you can do when creating a marketing campaign plan is to determine the top priorities and goals for the campaign. Successful campaigns can affect the growth of your business over time in many different ways, including brand awareness, lead generation, sales support, customer retention, and more. For many companies, brand awareness and new customer acquisition are top priorities for marketers in 2018 — and so is customer experience. So how do you know which is more important for your campaign? The biggest mistake marketers make when choosing the objectives for their marketing campaigns is to expect the plan to check every single box. Planning a marketing campaign that focuses on too much — like raising brand awareness and generating leads — will result in a campaign that is unfocused and ultimately unsuccessful. While there are marketing campaign examples that have achieved both of these priorities, it is best to focus on one clear objective that fits into your overall marketing strategy and helps you achieve specific goals. So what should you focus on? Building awareness for your brand involves getting your company, product, or service recognized by your target market. The priority is to earn a reputation as an authority and a reputable brand so you are top of mind when your audience has a need for your product or service. This can be difficult for new companies starting out in a crowded market or for established companies moving into new markets. Generating leads through content and inbound marketing involves directly engaging with individual customers in your target market and collecting contact information or indications of interest. Lead generation often involves list building for the purpose of sending emails, generating sales leads, or nurturing leads through additional marketing campaigns. The next step when planning out your campaign is to set specific goals and key performance indicators (KPIs). Another critical mistake marketers make is confusing the above objectives with actually setting goals. While your main marketing objectives will dictate the direction of the campaign, your goals should be much more specific and measurable. Your marketing goals are the checkpoints for your marketing plan that help you determine how well you are achieving your overall marketing objectives. Whichever KPIs you use to track your marketing campaign plan effectiveness, make sure you set specific goals related to those KPIs that have clear number and time metrics. Once you have a clear destination and checkpoints to measure success along the way, you can begin to strategize how you will achieve your marketing campaign objectives. There is danger in a plan that isn’t well-thought-out, so make sure you spend ample time strategizing. Budget: Your marketing campaign budget should be determined by the specific goals you are looking to achieve. For example, if you are trying to generate 1,000 new leads at a cost per lead of $5, your campaign budget is quite clear. Determine the business value of achieving your goals and judge your budget from there. Timeline: How soon do your campaign objectives need to be achieved? If you are trying to build brand awareness leading up to a new product launch or a conference, your timeline will be clearly outlined. Even if there is no specific event you are building up to, define a date and set benchmarks along the way to make sure you are on pace to achieve your goals. Strategies and Tactics: The specific tactics you use in your marketing campaign, from content marketing to paid advertising, will greatly depend on your overall campaign goals, budget, and timeline. Choose the right digital marketing tactics that work towards your goals and fit within the constraints of your time and budget. No matter what the objective is of your marketing campaign plan, taking time to define what you are looking to achieve is the best way to see a positive ROI for your marketing efforts. Are you looking to create a better marketing strategy? 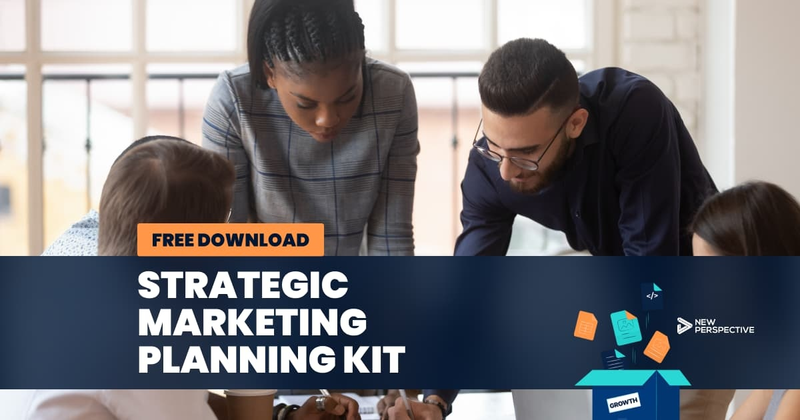 Download your free strategic marketing planning kit — it includes the tools and templates we use to work on our own strategic planning. It will help you conduct research, create a targeted persona, and set strategic goals.